Location: Uganda is inEast Africa, the DRC lies to the east and Kenya to the west, see map. Language: English (official national language), Ganda or Luganda, Nilo-Saharan languages, Swahili, and Arabic. Climate: The climate is tropical; generally rainy with two dry seasons (December to February, June to August). Average daily temperatures rarely exceed 29 Celsius (84 F). Click here for average temperatures in Kampala. When to Go: June - August and December - February. Gorilla Safaris are a huge draw for tourists visiting Uganda. You can see rare mountain gorillas in two of Uganda's National Parks; Bwindi and Mgahinga, click here for more information. Uganda's National Parks offer excellent safaris and fantastic birding opportunities. Two of the best parks include Queen Elizabeth National Park and Murchison Falls National Park. Rwenzori Mountains, one of Africa's finest trekking destinations, the "Mountains of the Moon" offer snow-capped peaks and fantastic trails. Kampala, Uganda's capital is a pleasant place to base your visit from, with good nightlife and friendly restaurants and bars. Tourist Information Office: 13/15 Kimathi Avenue, Impala House, PO Box 7211, Kampala, Uganda, E-mail: utb@visituganda.com, Web Site:http://visituganda.com/index.php. Set on 90 acres in the Speke Resort complex and with a majestic view of Lake Victoria, Munyonyo Commonwealth Resort is Uganda's leading 5 star resort specifically constructed to host the 2007 Commonwealth Heads of Government Meeting (CHOGM) Munyonyo Commonwealth Resort has earned worldwide recognition as the President's resort. It has hosted numerous high profile guests from Heads of State and Foreign dignitaries to international celebrities, who consider it a home away from home. Munyonyo Commonwealth Resort is dedicated to providing unrivalled comfort and unmatched services. The resort has 59 Presidential suites with a unique blend of traditional Ugandan and ultra modern finishing that merge into the Pearl of Africa theme which is carried throughout the entire decor. The many room features an amenities ensure a seamless transition from pleasure to business and vice-versa. shopping, and entertainment areas, make it the ideal choice for leisure and business travelers. Uganda�s famous �Silverbacks�, the dominant male gorillas in the forests of Bwindi and Mt. Mgahinga, no doubt inspired the creators of the upcoming �Silverchef Competition� when chosing the name for the event, which later this year will pit South Western Uganda�s most accomplished chefs against each other as they seek to claim the pinnacle of their careers. Miha Logar, known for his love of this part of Uganda which he made his adopted home over the past decade, overnight shared the outline of what the first ever such cooking competition in one of Uganda�s major tourism hubs will entail to have as many aspirants apply to be part of the event as possible. Set for the border town of Kisoro where the famous Travellers Rest hotel is hosting the event, will the main focus be to draw fresh attention to this region�s key tourism attractions. Besides access to the two Ugandan gorilla national parks of Bwindi and Mt. Mgahinga is the area rich of cultural attractions too and awaits to be discovered by tourists coming to hike and bike across one of Uganda�s most scenic terrains. Lakes like Mutanda with several top lodges now along the shores or overlooking the lake from view points above, make for spectacular backdrops when taking pictures, inevitably hearing repeated �awesome� shouts from the wagenis who made their way that far into Africa. The cooking competition however will also highlight the changes Uganda�s hospitality industry has undergone in recent years with investments in new lodges, state of the art kitchens and the training of staff, especially cooks, to lift food standards to the top of the regional offerings. Gorilla Highlands is inviting the lodges and hotels in the districts of Kabale, Kanungu and Kisoro to the first ever cooking competition, Silverchef 2015. Hosted by Travellers Rest in Kisoro on 21 November 2015, Silverchef will be an opportunity to celebrate the culinary excellence in the Gorilla Highlands region, foster cooperation and cameraderie and promote our region nationally, across the East African Community and internationally. Due to space limitations only 10 chefs will be able to compete, each preparing one meal for five people, using set ingredients and cooking with gas and/or charcoal. Please submit your candidate through the form below by 15th of October 2015. A week later our jury led by Prof. Dr. Wolfgang H. Thome will announce the chosen competitors and send them the list of ingredients. These ingredients are not to be purchased, they are for planning purposes only. Instead the lodges where the chefs work will need to pay a participation fee of UShs 70,000/- . This fee will allow Travellers Rest to buy all that is needed to provide the contestants with the ingredients they will need to prepare a meal of their choice. The lodges where the chefs work are also expected to finance the competitors� transport while accommodation will be catered for them in Kisoro. The competitors will have to arrive to Kisoro on 20th of November and leave on 22nd of November. The winner will receive a silver hat and the best five chefs will get a certificate. Let the tastiest and most creative meal set the judges taste buds alight and make its creator famous! For generations, Mgahinga dense forests were home to the indigenous Batwa pygmy tribe. This tribe of hunter-gathers, fierce warriors who depended on the forest�s shelter, food and medicine were the forest�s first people, their ancient knowledge of its secrets remains unrivalled and this can be seen during the fascinating tour through the Batwa trail as your lead by Batwa guides. Some of the steep mountain slopes contain caves formed by lava tubes one of them being the famous Garama cave, a sacred place for Batwa. During the Batwa trail you can discover how it was used as a shelter during battles and as a place to store looted treasures. The Batwa who were originally poachers are now earning from tourism as they provide music, dance and drama to tourists. Many have abandoned their caves, settled in societies and now also access services like education and medication. They have appreciated nature and they are now part of the conserving team as some have been hired by uganda wildlife Authority as park guards. During the Batwa trail around the foothills of the virunga volcanoes, visitors are able to spot forest birds, the Rugezi swamp, wild vegetation, bamboo forests and glorious views of the surrounding lakes and agricultural villages. Golden monkey and mountain gorilla tracking can be done at an extra cost. Mgahinga is located 500km from Kampala /Entebbe and can take 8hours plus when travelling with uganda walking Safaris. However, the long drive to Mgahinga is quite enchanting with great sceneries all through like the Equator, lake Mburo national park ( for some Queen Elizabeth national park with tree climbing lions and abundant wildlife) terraced mountains with flowing rivers and a lot of rural africa. 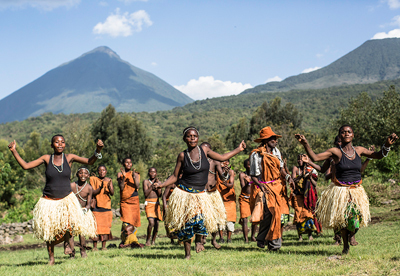 The funds collected from the Batwa trail also contribute to their living as it�s given back to their societies. First Africa Media Exchange to be featured at 4th IIPT African Conference on Peace Through Tourism, Kampala, Uganda, 20-25 May 2007. The 4th IIPT African Conference, under the patronage of His Excellency Yoweri Kaguta Museveni, President, Republic of Uganda, is being organized in partnership with the Africa Travel Association, and hosted by the Uganda Ministry of Tourism, Trade and Industry. Last week H.E. President Museveni launched PRESTO, his Presidential Initiative for Sustainable Tourism in London, at a small tourism exhibition at Central Hall Westminster. The hall was filled with many tour operators, potential investors, businessmen, press, Ugandans and other Africans from the Diaspora. 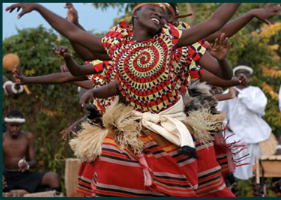 The exhibition portrayed the beauty of Uganda through postures and pictures of wildlife, flora and fauna as well as the cultural tradition such as a large banner reading �Irresistible Uganda� depicting a gorgeous Karamajong girl. This was complimented by the display of many handicrafts which the public was eager to buy. Ugandan coffee and tea was being served to add to not only the feasting of the eyes but also to give the public a taste of the �Pearl of Africa�. The President had mandated his Principal Private Secretary, Hon. Grace Akello to organize this exhibition and in doing so was assisted by a Ugandan born international marketing consultant Willy Mutenza, who also organized the first Uganda Convention in London last year. The launch of PRESTO in London followed Uganda�s attendance of the Brussels Expo Holiday Fair in Belgium earlier this month which was supported by Brussels Airlines and the Brussels Embassy with assistance of Amb. Mirjam Blaak. This initiative is to enhance sustainable tourism in Uganda and follows the creation of a new Ministerial Portfolio of the Ministry of Tourism Wildlife and Heritage which hitherto has been run as a subsidiary function in a number of Ministries. Both the Minister Hon. Prof. Ephraim Kamuntu and his Permanent Secretary, Amb. Patrick Mugoya were present during the launch as well as other members of the entourage of the President Hon. Dr. Crispus Kyonga, Minister for Defence and Hon. Henry Okello Oryem, Minister of Foreign Affairs, his Permanent Secretary, Amb. 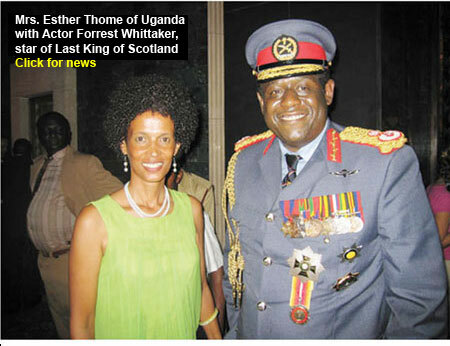 James Mugume and two Members of Parliament, Lt Gen Wamala Katumba and others. Uganda was voted Number One Tourism Destination for 2012 by the Lonely Planet. Virunga Volcanoes as �a must-see-place for 2012�, among the 20 places one has to visit in their lifetime. Bwindi Impenetrable Forest, famous for its mountain gorillas, was voted the number one birding site in Africa. Murchison Falls was also ranked among top 10 birding sites in Africa. The famous �tree climbing lions in Ishasha in Queen Elisabeth National Park was the photo of the month in the National Geographic Magazine. 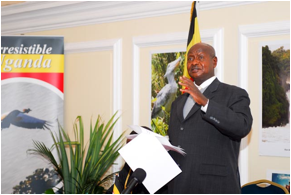 The President emphasized that Uganda is endowed with unique and rich ecological and cultural resources, a hidden treasure still to be discovered by the rest of the world. Uganda is one of the biodiversity rich countries with 18,783 species of flora and fauna. �Uganda�s outstanding traditional hospitality and warm welcome should encourage all of you present here to come and visit and possibly invest in Uganda,� the President�s words before declaring PRESTO launched and invited the public to ask questions.